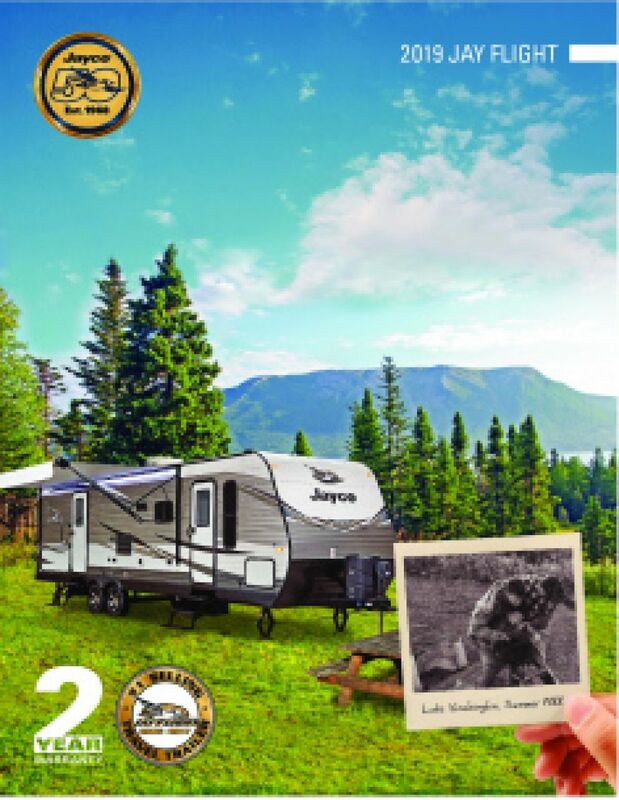 See the country with the 2019 Jayco Jay Flight 33RBTS Travel Trailer! At All Seasons RV, our dream is to see that every one of our customers gets to own the RV of their dreams! We've been doing just that for years, which is why we're one of the top RV dealerships in Michigan! We have a massive inventory of all the top RV brands and models, and you can stop into our huge indoor showroom and tour all of our great RVs in comfort and leisure! Our knowledgeable, professional, and courteous staff will show you how easy it is to own your dream RV! So come in today! We're conveniently located at 4701 Airline Rd Muskegon Michigan 49444 and we're always ready to help our customers find the RV they've always wanted! Even if you don't live in Muskegon, we can still make your dream come true, thanks to our fast, reliable, door-to-door delivery and quick, easy financing! Give us a call at 231-739-5269. Your dream RV is waiting! This RV is easily towable with a hitch weight of 915 lbs. and a rugged GVWR of 10950 lbs! When you're all set up, just roll out the 20' 0" patio awning for shade and comfort! 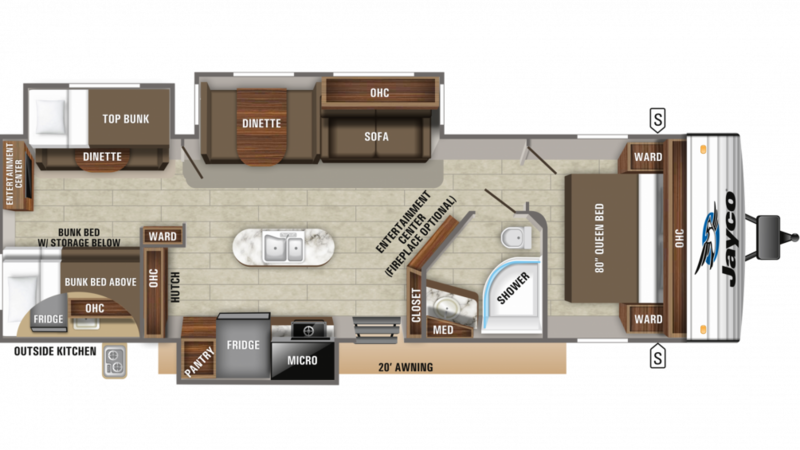 This Travel Trailer is so roomy and comfortable! It's 37' 8" long, 8' 0" wide, and comes with 3 easy to open slides that maximize the living space! And when it's sizzling outdoors, the efficient 13500 BTU a/c unit will keep everyone cool and comfy. Likewise, the 35000 BTU furnace will ensure you're toasty and warm on the coldest nights! You'll sleep like royalty on the Queen bed in the master bedroom! This cozy camper has enough furniture to sleep up to 8 people! When it's time to prepare a meal for your family, you'll have the convenience of a kitchen that comes with all the modern cooking appliances you could ask for, including a 3 burner range cooktop for making delicious hot foods! And you can store all your favorite fresh meats, veggies, and cold drinks in the 8.00 cu. ft. refrigerator! The sink has clean water provided by the 80 gallon freshwater tank. The bathroom features a Porcelain Foot Flush toilet and a shower. The water stays nice and hot, thanks to this RV's 60 lbs. of LP tank capacity! The 39 gallon gray water tank and the 39 gallon black water tank discreetly stores dirty water and waste. This handsome Travel Trailer features 4 beds, thanks in part to the roomy bunkhouse with its Bunkbeds! At the end of a great day of outdoor fun, kids or guests can look forward to a cozy night's sleep in peace and quiet! When the weather is too nice to be indoors, why deprive yourself just because it's mealtime? With the handy outdoor kitchen, you can whip up delicious meals outside for everyone, whether it's breakfast, lunch, or dinner! Great food, fresh air, sunshine!